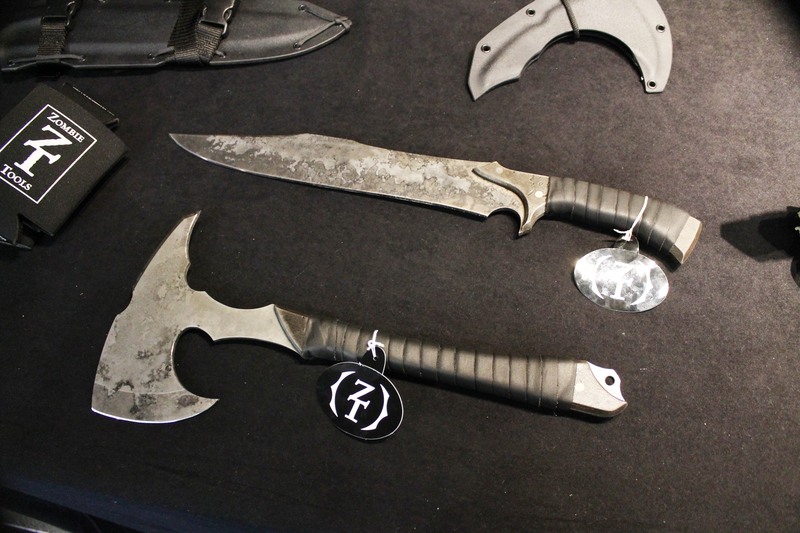 Zombie Tools had by far the most interesting display booth at BLADE Show 2015. Their wares were as distinctive as they were lethal. 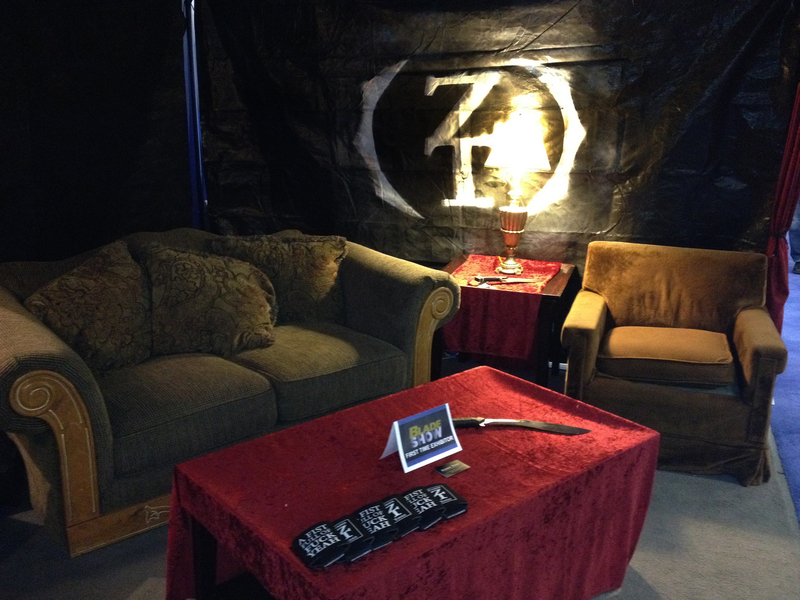 Heck, they even had a little lounge for resting between sprints from the angry undead! 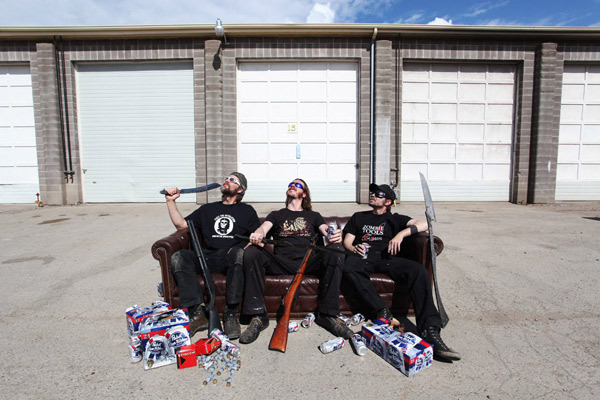 These guys from Missoula, Montana were just a bit off center–in a good way. Zombie Tools’ knives are Made in the USA with home-sourced materials, down to the grommets on the kydex sheaths. Carbon steels such as 5160, 5150, and 6150 are used as the basis for the pieces. 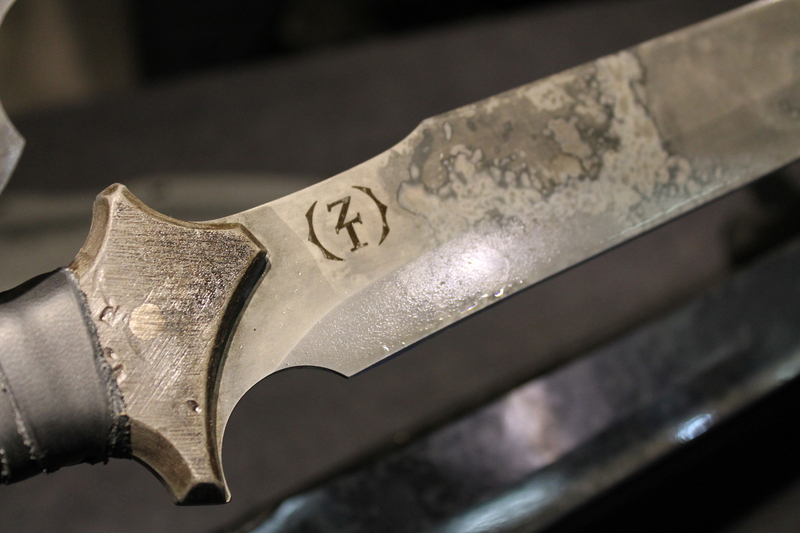 The finished blades are given a proprietary acid-washed finish that looks impressive. 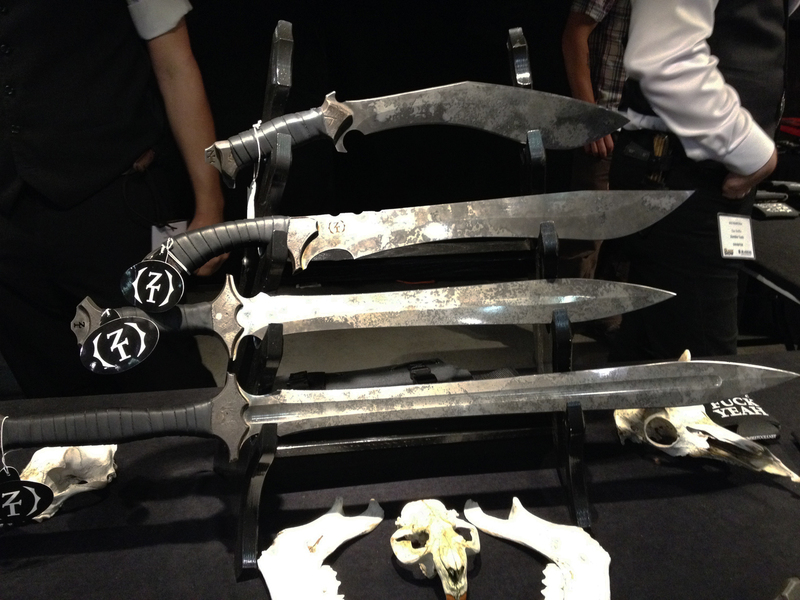 Actually the sheer size of some of the knives/swords/choppers/axes was impressive. With names such as the Sharkalope, Mack Daddy-O, Felon, Hooligan, and Sin Bad, fear should be stricken in some rotting heart somewhere. The knives I handled had a lighter weight than I thought they would have. Chalk it up to the aluminum scales riveted to the steel. The scales get the same type of acid-washed look as the blades. 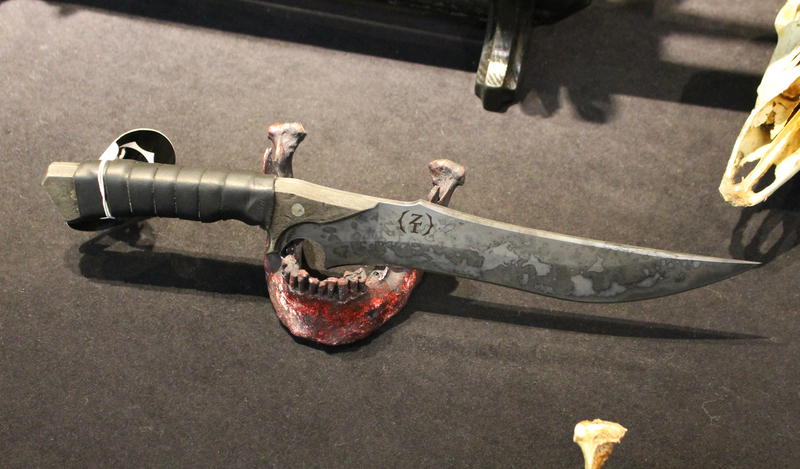 Given a wrapping of good ole black-dyed cow hide, the Zombie Tool is ready for use. 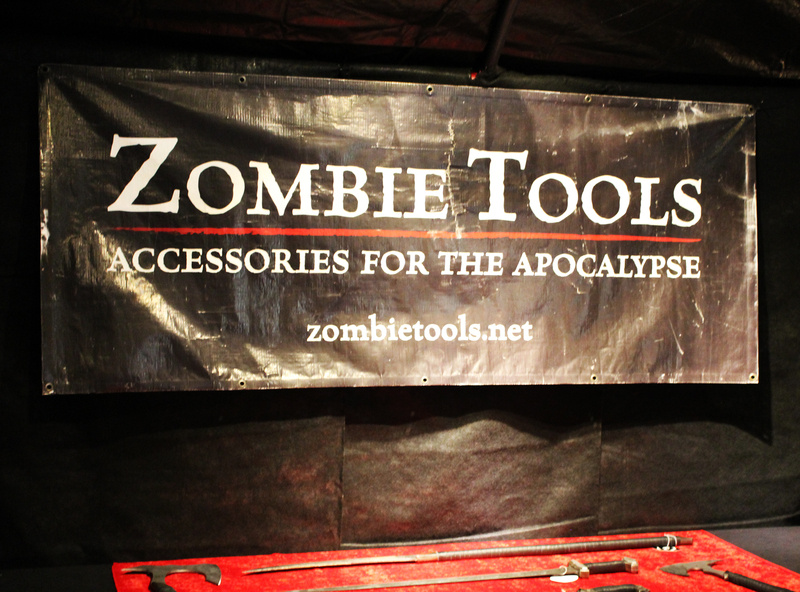 Zombie Tools are made to order, so expect a waiting period. The knife at the top of the article is the Felon and it sells for just $279.95. That is a great price for a 12 3/4″ bladed Bowie knife. Nearly all the tools run under $500.00. I was lucky to have a sit on the Zombie Tools’ couch and water down before leaving with a foreboding sense that something was…following me. 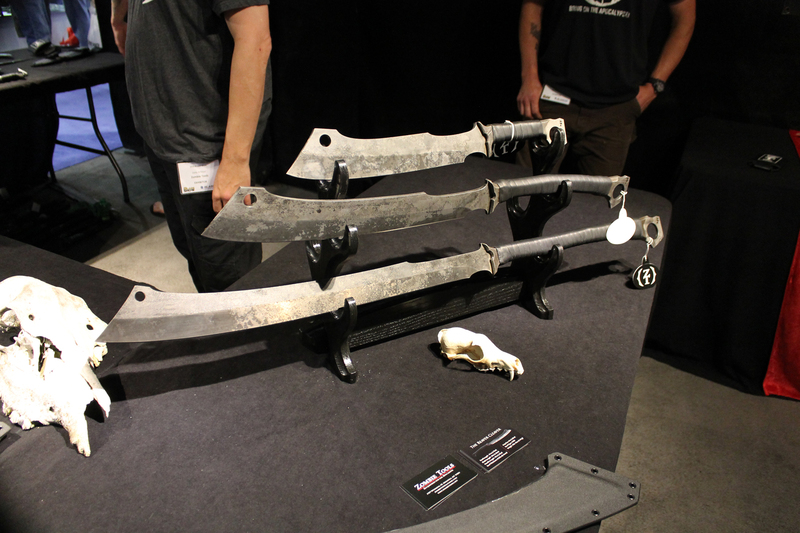 This entry was posted in Knives and tagged Axe, BLADE Show, Fixed Blade Knife, Tomahawk, Zombie Tools. Bookmark the permalink. Picked up a couple of Zombie Tools at this year’s Blade Show. The guys were great to work with and their knives are tough as nails. Tough knives with a fantasy flair!